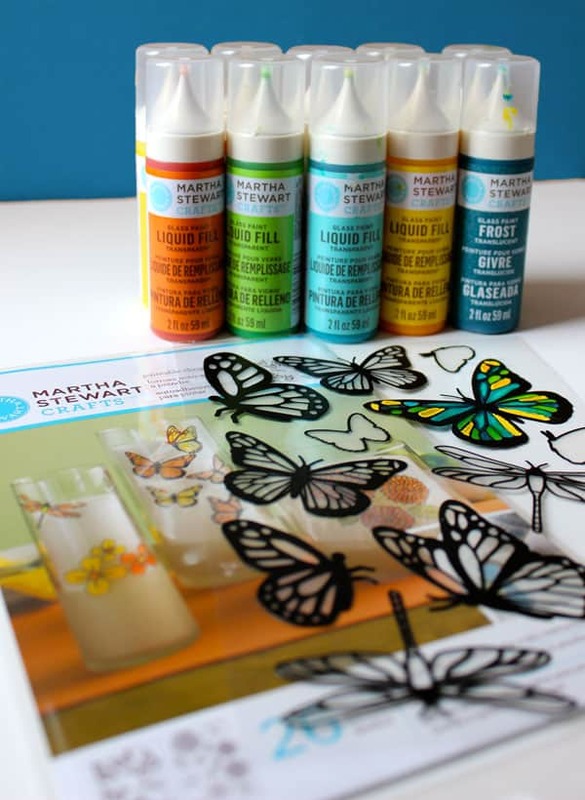 I recently got the chance to try these great new products from the Martha Stewart glass painting program, and let me tell you I’m in love! I had a lot of fun painting the clings, mixing colors, a trying a few techniques. They are so easy I even let my 3 year old give it a try (her results were beautiful too). 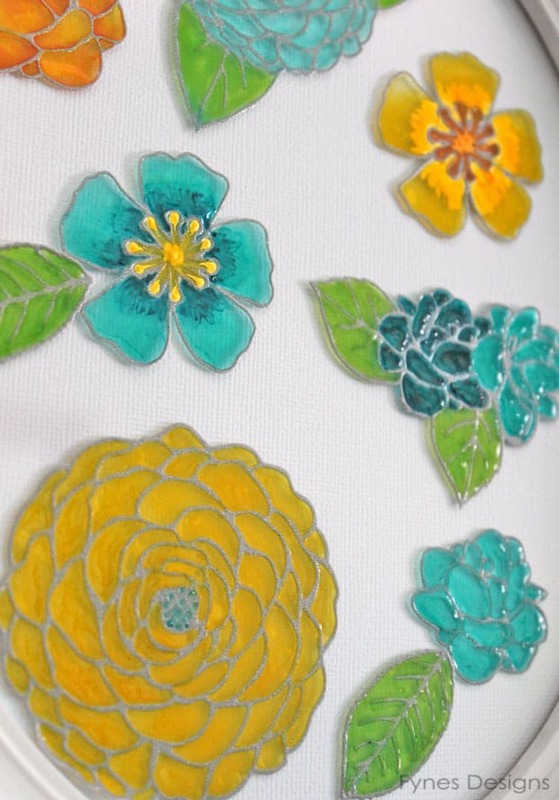 I used Martha Stewart paintable clings ‘flowers and leaves’, transparent fill, and a bit of frost fill. All these products are available at Michaels. Painting the clings is done very easily by just using the tip of the bottle (color like you are using a marker) but don’t squeeze, the fill will flow at the proper rate. 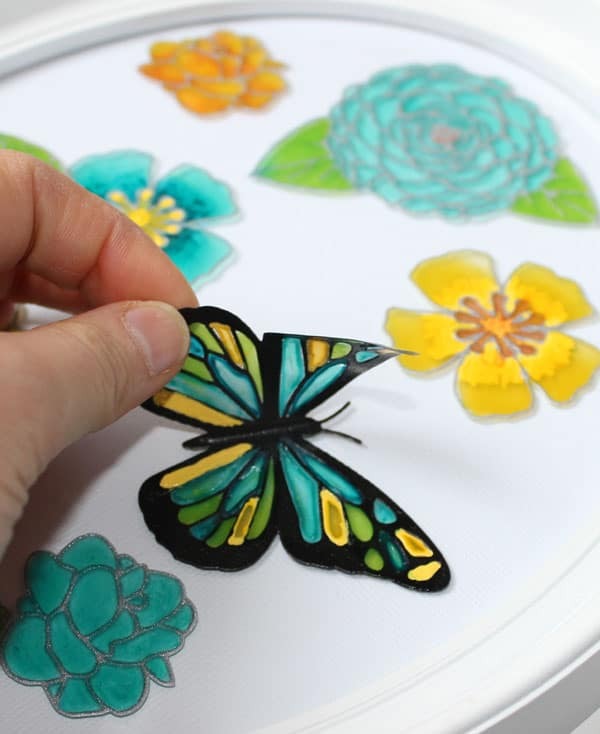 TIP: A few extra things you might want on hand are -a paper towel to dab up accidental over filling, a toothpick (incase you get any air bubbles), and a tiny paintbrush if you want to experiment mixing the colors. Once your clings are painted to perfection, allow them to completely dry (a few hours). While you’re waiting you can prepare a photo frame. I found my frame at a thrift shop for $1! I gave it a quick coat of spray paint and cut a piece of plain card-stock to fill the frame. When my clings were dry I simply peeled them off the plastic backing and right onto the galss of the photo frame. 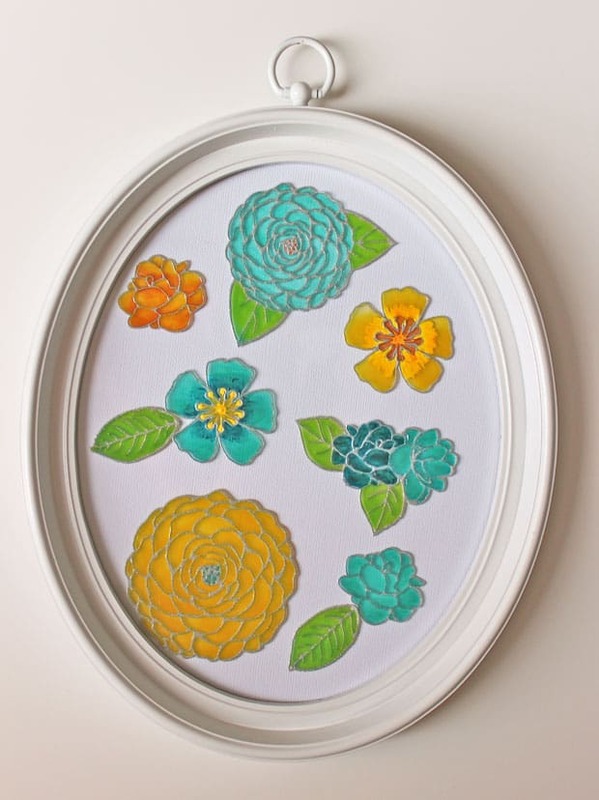 Instant art, easy-peasy! If you tire of this masterpiece you’ve created, no biggie- the clings peel right off (they are still useable for another project) and you can replace them with another! Looking for more artsy inspiration? See you tomorrow for Day#4 of Cheap Art Week! You are amazing! What great ideas. Thanks for sharing! Thanks Claudine, I’m really having fun on a budget… doesn’t alway pan out that way! Love it, Ginny! Beautiful colors. And what a find with the frame! Where do you like to thrift shop? I love the fact that the clings are reusable! Love love love the colors you chose!! Love the frame…Thanks for sharing!! This is gorgeous and such a fun idea! Love! I was so pleased to be a past of this Street Team, I loved the products! Will these paintable clings work on a painted mixer? Would I be able to wipe them clean if they get batter on them? Worried about durability. I think they would be fine, I’ve used mine for about a year now with no troubles!